Storage | Wake up, Meeples! 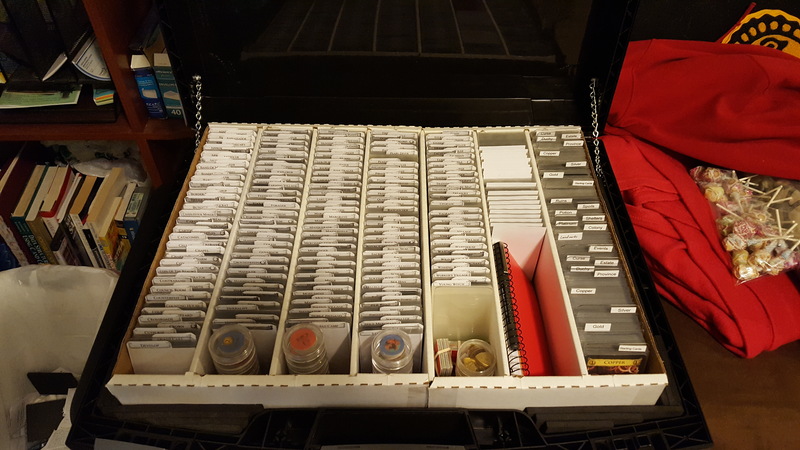 This page will show the history of my Dominion storage solution, since I get asked about that quite a lot. 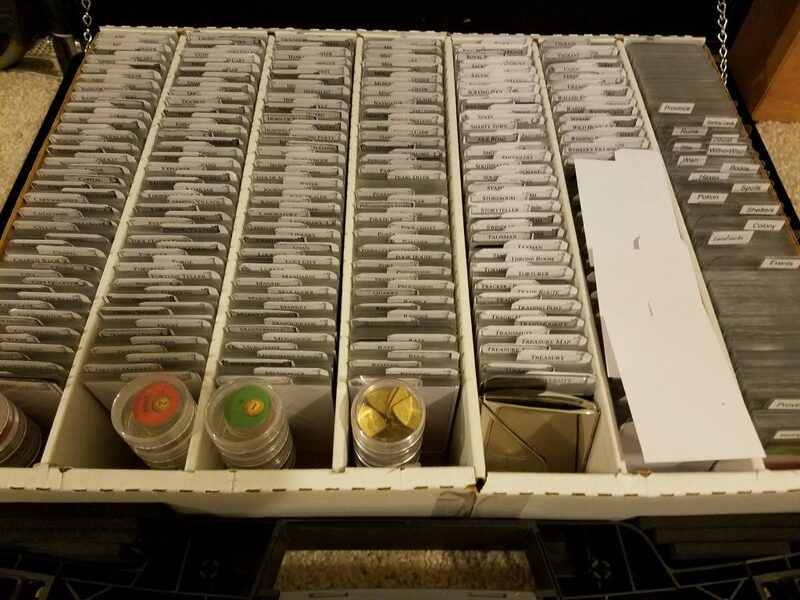 If you want details on previous versions of my storage solutions, you can check out this thread. 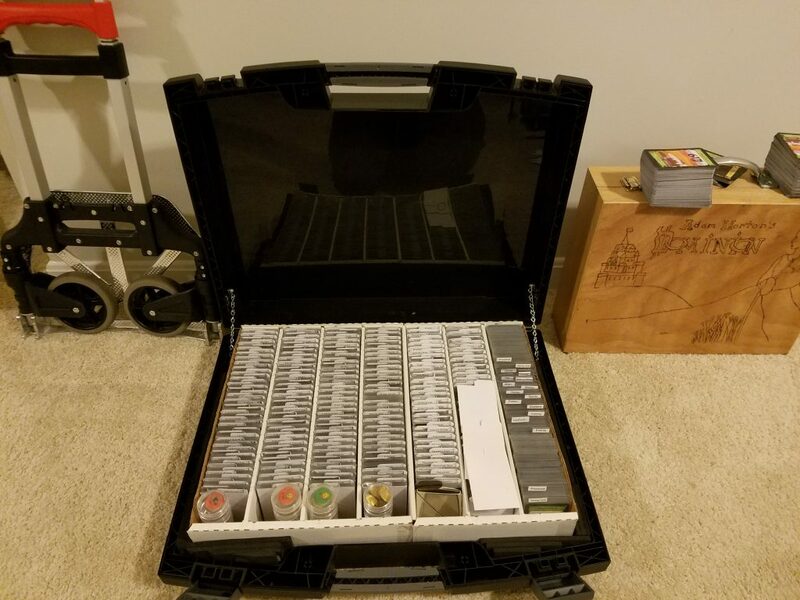 Here are some pictures of my old wooden box solution with some extra tournament supplies in it. Overall, the current solution I have (detailed on this page) works well and is necessary if you want to sleeve your cards. If you don’t sleeve your cards, the wooden box will easily work for you. 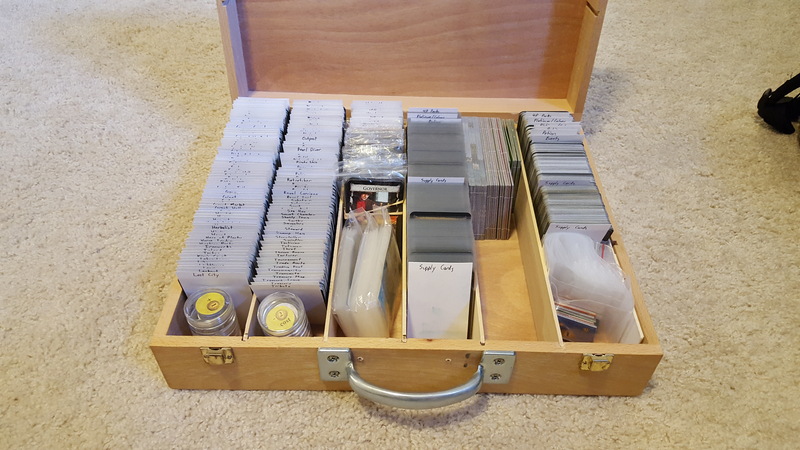 A briefcase-style solution is important to me, this is mostly because making an insert is going to be the easiest when I can put the cards on end and have nothing on top of anything else. I don’t want to have to remove anything from the box to access my stuff. 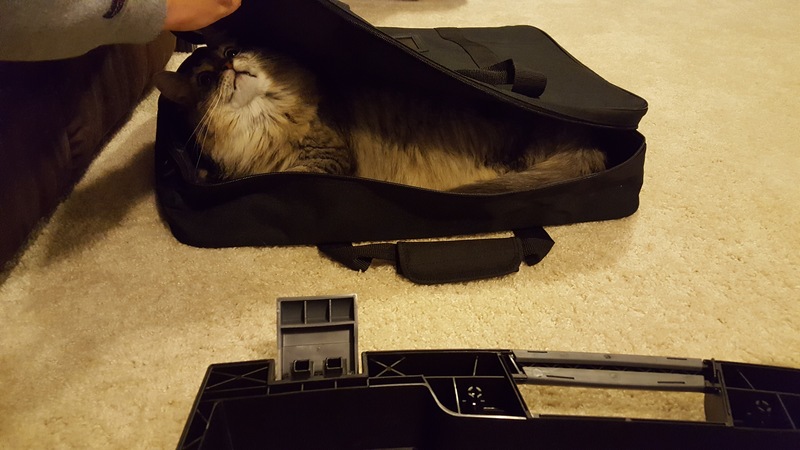 It turns out that it’s pretty difficult to find large briefcases, especially those that are meant to be filled with as much weight as I’m putting in them. I already had to replace the handle on my old case twice and it still makes me nervous. 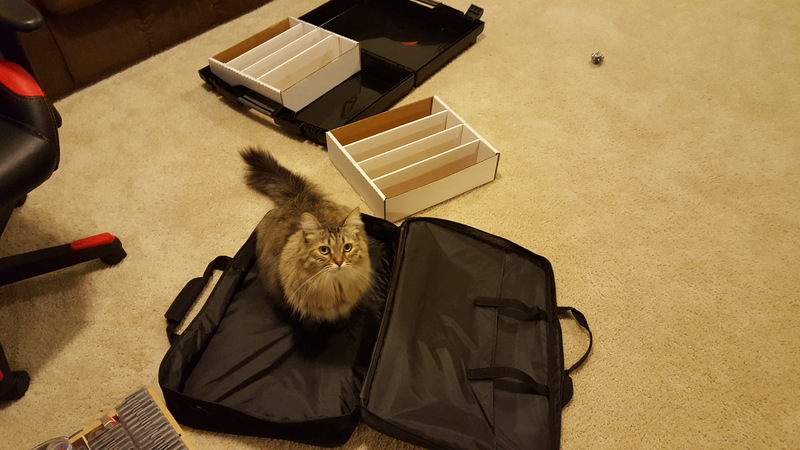 It’s really hard to find a briefcase that’s large and durable enough for what I want, I was down to a few options. 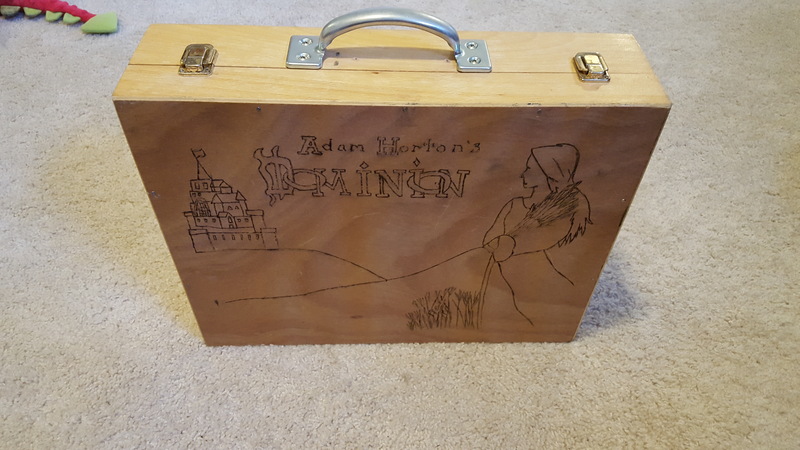 Custom briefcases: I contacted several custom case companies about making a box for me. Many of them advertised that they have no minimum orders, etc. but none of them ever responded to me. BOO! Cases by Source: I came across a reddit post by someone who had used a soft bag to make a storage solution he really liked, and he used Cases by Source as his vendor. They actually had a couple of products on their site that might work for me, but they have a $100 minimum order, and I can’t find their products in stock anywhere except their website, which is a little bit sad. What I ended up doing was finding two cases I thought might work and ordering them both. I figured I’d get at least one working solution out of it. I also ordered these boxes to use as the inside of the box, also suggested by that reddit post. 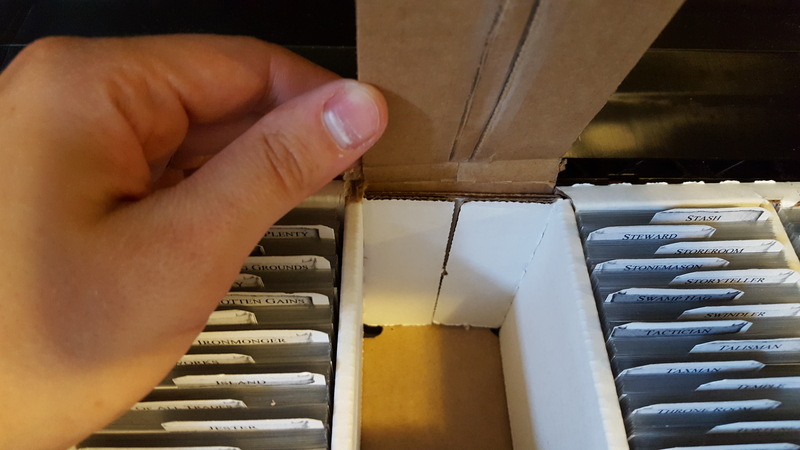 You may have noticed in the first picture I linked, that the rows on those cardboard boxes are wider than Dominion cards. After some measuring I discovered that I could get an extra row in both boxes if I made them shorter. 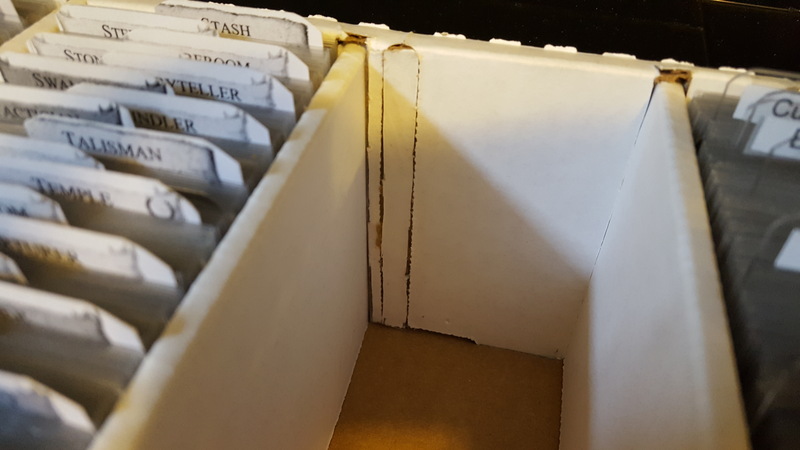 Fortunately, this isn’t too difficult to accomplish, all I had to do was cut some new holes in the cardboard and use that with some tape to plug up the old holes, and I can move those cardboard dividers wherever I want (picture). This has already been done in the first picture if you look closely. 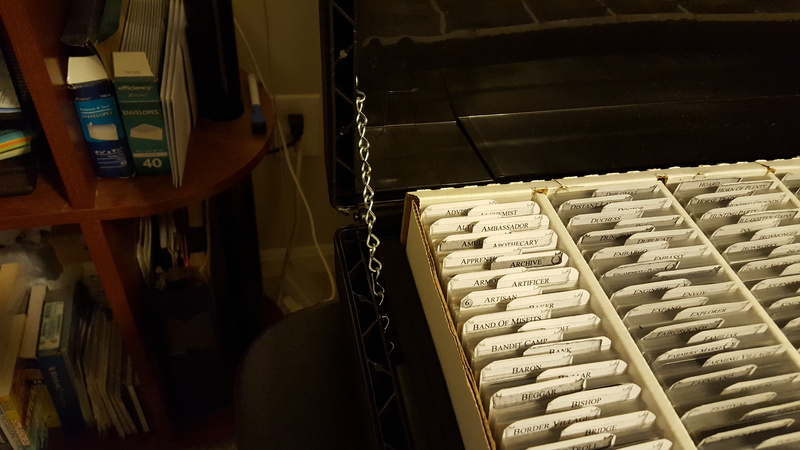 With some creative folding, cutting, and taping, I merged the two boxes into one giant box with smaller rows and one less row, but it actually fits in both boxes (picture). For the soft case I found some “hardboard” at the hardware store and put that under the boxes, then I got some foam to put around the edges so that everything fits tightly, and it turns out that both cases were functional and looking pretty good. If it turned out this way, I had planned to give one of them to a friend of mine who frequently lets me use his cards for my IRL tournaments; I chose the hard case for myself and gave him the soft one. Here’s a picture of the finished case. So the hard case had one big problem remaining: the lid has to just rest behind the case whenever it’s open, which takes up a huge amount of table space, and is probably bad for the hinge if it has to go off the edge of the table. I wanted to rig something up so that the lid would stay vertical, so I just bought a small length of chain and screwed it into the sides of the box near the hinge. Here’s a picture of that. It fits nicely into the hole I cut in the foam for that, and after some adjustments it worked the way I wanted. Other components: there isn’t all that much that’s new here, but I’ll cover it anyways. The plastic containers for tokens are just bead storage containers that I found in the craft aisle at Wal-Mart, you can find them in just about any craft store as well. I use them for lots of games. The dividers on the right are PlexiGlas dividers that I used to use before Empires, but they ended up being too thick and I needed to make room for cards. I still use them for the supply piles, though, since they get a lot of use and the thickness is more welcome there. The dividers on the left were generated by Sumpfork’s tab generator and printed on 100-weight non-glossy cardstock. I ended up printing them in black and white because I thought they looked better that way. 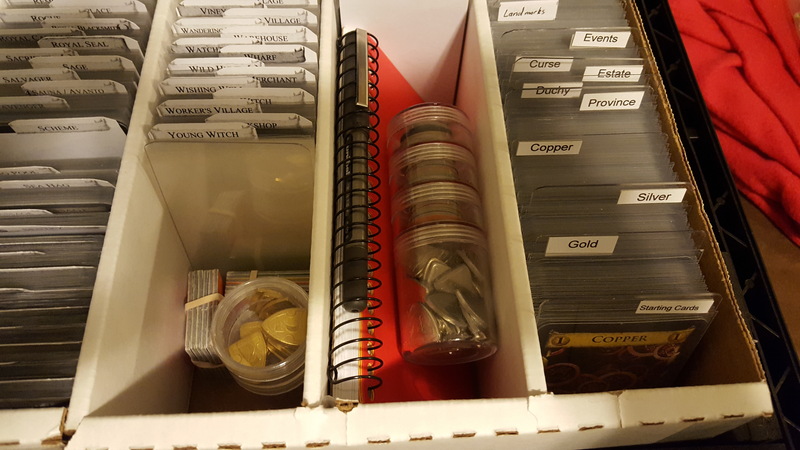 With this storage solution I have enough room for two sets of supply cards again, as well as a whole row that I can use for proxies and playtesting (I just put the removed first edition cards, my blanks, and the cards I don’t like in there). I have enough extra room that I can even keep my notebook in there. I’d also like to put something on the inside of the lid so there’s something nice to look at there instead of just blank plastic. I have an idea for a fold-out miniature basketball hoop with a trash can below it for fun with trashing cards, other people have suggested a collage of relevant Dominion pictures and stuff that I’ve accumulated over the years. I guess I could make a pouch for the rulebooks but that just doesn’t appeal to me. 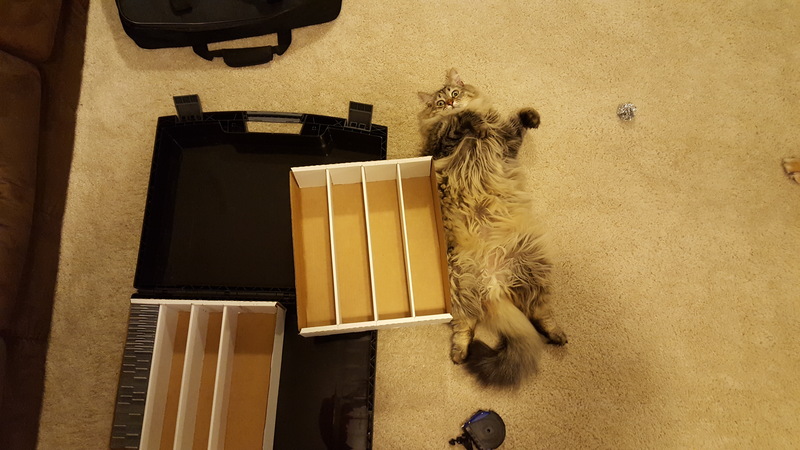 It turns out that when you add more stuff to the case, it gets heavier. Who knew? The handles on these new cases should hold up to the weight, but I recently bought this collapsible dolly which is great for carrying the case long distances. In any case, after Nocturne, the box could easily fit two more similarly-sized expansions and potentially three, so I’m hoping this will last for a while longer.